Close to 500 students presented their latest research at the SDSU 10th Annual Student Research Symposium (SRS) held at the SDSU campus March 3-4, 2017. The competition and exhibition featured both undergraduate and graduate students describing their original scholarly work in a variety of disciplines. Over 60 awards for excellence were presented in recognition of outstanding oral and poster presentations. 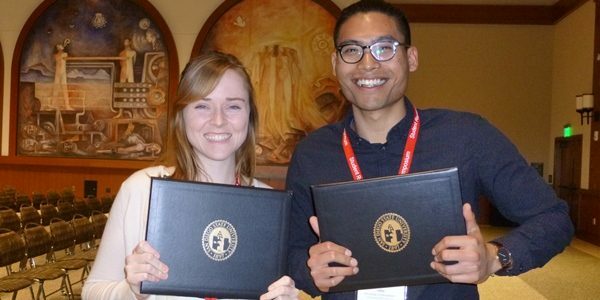 At the reception and awards ceremony held on March 4, MARC scholars, Madison Kennedy, a biochemistry major, and Rifqi Affan, a psychology major, received accolades for their posters presentations. Madison received the Undergraduate Research Excellence Award for her poster entitled, The Characterization of the Receptor Tyrosine Kinase Tie2. Her research focused on the nearly one-third of human kinases that are implicated in disease, and this enzyme class has proven to be an enormously successful drug target for combating many diseases. Tie2 is an endothelium-specifc receptor tyrosine kinase (RTK) responsible for angiogenesis and vasculature maintenance. Mutations in this enzyme can cause venous malformations for which no current therapies are available, and Tie2 has been implicated in cancers such as breast and gastric. However, the molecular mechanisms of Tie2 activity are not well understood. In this research, Madison and her mentor propose the first in vitro function studies of Tie2. In order to perform any of these studies, they must first express and purify an active Tie2. In this work, they will develop robust purification strategy using heterologous expression in insect cells. The findings of this preliminary work revealed the optimum strategies for expressing Tie2. Future work will explore the catalytic rates of the kinase activity in order to improve understanding of the catalytic features of wild-type and mutant Tie2, and can inform the development of therapeutic targets for vascular disease. Rifqi Affan, received the Dean’s Award for the College of Sciences for his poster entitled, High Intensity (binge) Drinking is Associated with Altered Neural Oscillations in Young Adults. Rifqi’s research was designed to examine the neural oscillatory profiles of individuals with a history of binge drinking pattern during eyes-open and closed wakeful rest, using electroencephalography (EEG). Sixty-one healthy, young adults participated in the study. Participants were segmented into binge drinking group and light drinking group based on the number of binge episodes reported within the last six months. Continuous EEG signal was analyzed with a multitapered Fast Fourier Transform to measure characteristics of canonical frequency bands including theta (3-7 Hz), alpha (7-13 Hz) and beta (15-20 Hz). Binge drinkers displayed significantly slower alpha peak frequency, in addition to greater theta and beta power than light drinkers. These results suggest that heavy episodic alcohol consumption in young adults is associated with persistent, maladaptive changes in the brain that may contribute to impaired cognitive capacity. We congratulate Madison and Rifqi on their outstanding achievement and express our appreciation to Madison’s mentor, Dr. Christal Sohl, faculty member in the Department of Chemistry & Biochemistry, and Rifqi’s mentor, Dr. Ksenija Marinkovic, faculty member in the Psychology Department, and their lab team members for the support and guidance they provided during this research, and continue to provide to our MARC scholars. Congratulation to all – fabulous job!